Concrete Evidence Liquid Cyanoacrylate can be used in conjunction with our Hot Plate (HP-120) or with an existing heating source or cyanoacrylate fuming chamber to provide users with a fast and effective method of developing latent prints. 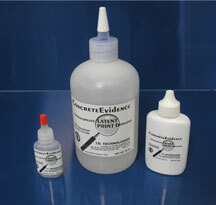 Cyanoacrylic fuming works on latent prints because fumes adhere to water marks, and latent prints are 98 to 99 percent water. If footwear impressions are composed of dried liquid, cyanoacrylate fuming may be the best method to use for impression development and enhancement.